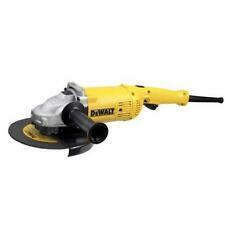 DEWALT D28113 110v Angle Grinder. Item is used so please see pictures for item condition. Lead has few splits in outer casing see pictures but doesn’t affect grinder in anyway. Fully working. Item will be posted within 2 working days of receiving payment. Please see my other listings. The Dewalt DWE4206K 230v 115mm Mini Grinder features a dust ejection system which removes the majority of debris from the air, it's anti vibration side handle improves the user comfort and the anti lock flange prevents the flanges locking up and locking the disc on. The high efficiency motor design improves the performance for some of the most demanding applications. This DeWalt DWE4206K 230v 115mm Mini Grinder is perfect for most grinding needs, its small disc allows access to grind confined tight spaces. Features and Benefits: No-volt release switch prevents the unit from starting unintentionally when locked on. The DEWALT DWE4206 115mm Mini Grinder is fitted with a no-volt release switch that prevents the unit from starting unintentionally when locked on. It has a small girth that allows comfortable gripping and it has a low profile gear case, that allows access in confined areas. The DEWALT DWE490 230mm Angle Grinder has an abrasion protected motor for increased durability. The two position side handle allows the user to optimise the handle position to give maximum comfort. Spindle Thread: M14. The Dewalt DWE4206KL 110v 115mm Mini Grinder features a dust ejection system which removes the majority of debris from the air, it's anti vibration side handle improves the user comfort and the anti lock flange prevents the flanges locking up and locking the disc on. The high efficiency motor design improves the performance for some of the most demanding applications. This DeWalt DWE4206KL 110v 115mm Mini Grinder is perfect for most grinding needs, its small disc allows access to grind confined tight spaces. Features and Benefits: No-volt release switch prevents the unit from starting unintentionally when locked on. The DeWalt DWE492K Angle Grinder has an abrasion protected motor for increased durability. The two position side handle allows the user to optimise the handle position to give maximum comfort. 1 x Kitbox. 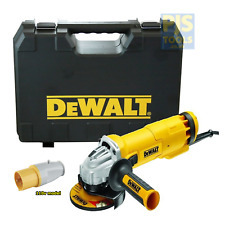 The item you are currently viewing is the DeWalt DWE46101 110V 125mm Mortar Raking Grinder Kit. Pivoting side door allows mortar removal into internal corners. Spindle Thread: M14. No load speed: 10,000 RPM. Mon - fri 8:30am - 17:30pm, sat - 9:00am - 17.00pm, sun - closed. Staplers & Nailers. Weight: 2.1kg. Length: 285mm. Spindle: M14. Angle Grinders. No Load Speed: 11,000/min. Input Power: 1,010W. Dewalt DWE4206 230v 115mm Mini Grinder - DWE4206. The Dewalt DWE4206 230v 115mm Mini Grinder features a dust ejection system which removes the majority of debris from the air, it's anti vibration side handle improves the user comfort and the anti lock flange prevents the flanges locking up and locking the disc on. Mon - fri 8:30am - 17:30pm, sat - 9:00am - 17.00pm, sun - closed. Staplers & Nailers. Height: 151mm. Length: 490mm. Circular & Plunge Saws. Input Power: 2,200 Watt. Clearance Bargains. Marking Out. Mon - fri 8:30am - 17:30pm, sat - 9:00am - 17.00pm, sun - closed. Staplers & Nailers. Height: 151mm. Length: 490mm. Circular & Plunge Saws. Pressure Washers. Input Power: 2,000 Watt. Supplied with: 1 x Protective Guard, 1 x Side Handle, 1 x Inner & Outer Disc Flanges and 1 x Spanner. DEWALT DWE4206 1010W Angle Grinder - Yellow. Condition is New. Dispatched with Royal Mail 2nd Class. Slide switch angle grinder with no-volt release switch preventing unintentional start when locked on. High efficiency motor improves performance in demanding applications. Ergonomic design with low profile gear case for easier access in confined areas and anti-vibration side handle for improved comfort. Single speed. We are an established, professional, family run tool distributor and we really appreciate your custom! Carry case. The DEWALT DWE4206 115mm Mini Grinder is fitted with a no-volt release switch that prevents the unit from starting unintentionally when locked on. Dewalt Power Tools. It has a small girth that allows comfortable gripping and it has a low profile gear case, that allows access in confined areas. The Makita GA9020S angle grinder features great durability and soft start and sports a 2000 watt motor and is designed so minimal dust gets into the motor. 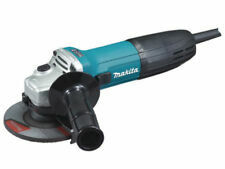 1x GA9020S Angle Grinder. 1x Dewalt 24" 6 Pockets Tool Bag. The Makita GA9020S angle grinder features great durability and soft start and sports a 2000 watt motor and is designed so minimal dust gets into the motor. 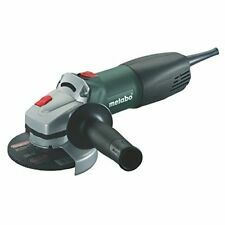 1 x GA9020S Angle Grinder. 1 x Dewalt Contractor Tool Bag. Dewalt DWE4206KL 110v 115mm Mini Grinder - DWE4206KL. The Dewalt DWE4206KL 110v 115mm Mini Grinder features a dust ejection system which removes the majority of debris from the air, it's anti vibration side handle improves the user comfort and the anti lock flange prevents the flanges locking up and locking the disc on. DEWALT DWE4206-LX 115mm Mini Grinder 1010W 110 Volt Version. DEWALT Part no: DWE4206-LX. The DEWALT DWE4206K 115mm Mini Grinder is fitted with a no-volt release switch that prevents the unit from starting unintentionally when locked on. Dewalt Power Tools. It has a small girth that allows comfortable gripping and it has a low profile gear case, that allows access in confined areas. Dewalt DWE4206L 110v 115mm Mini Grinder - DWE420L. The Dewalt DWE4206L 110v 115mm Mini Grinder features a dust ejection system which removes the majority of debris from the air, it's anti vibration side handle improves the user comfort and the anti lock flange prevents the flanges locking up and locking the disc on. The Dewalt DWE4206K 230v 115mm Mini Grinder features a dust ejection system which removes the majority of debris from the air, it's anti vibration side handle improves the user comfort and the anti lock flange prevents the flanges locking up and locking the disc on. The DEWALT DWE4206 115mm Mini Grinder is fitted with a no-volt release switch that prevents the unit from starting unintentionally when locked on. DEWALT DWE4206K-LX115mm Mini Grinder With Kitbox 1010 Watt 110 Volt Version. The DEWALT DWE4206 115mm Mini Grinder is fitted with a no-volt release switch that prevents the unit from starting unintentionally when locked on. 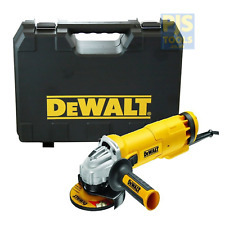 DEWALT DWE4206-LX 115mm Mini Grinder 1010W 110 Volt Version. The DEWALT DWE4206 115mm Mini Grinder is fitted with a no-volt release switch that prevents the unit from starting unintentionally when locked on. 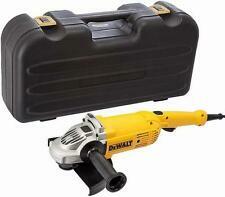 DEWALT DWE4206-GB 115mm Mini Grinder 1010 Watt 240 Volt Version. The DEWALT DWE4206 115mm Mini Grinder is fitted with a no-volt release switch that prevents the unit from starting unintentionally when locked on. 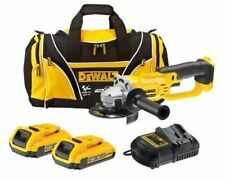 DEWALT DWE4206K-GB 115mm Mini Grinder With Kit box 1010 Watt 240 Volt Version. DEWALT DWE4206 115mm Mini Grinder. 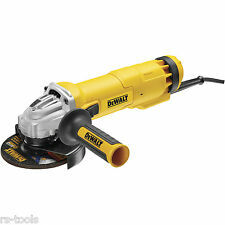 DEWALT DWE4206-GB 115mm Mini Grinder 1010 Watt 240 Volt Version. Panther Trading was established in 2013. We have category specialists that source products globally and we have a product catalogue of over 100 different products. High effeciency motor design improves performance in demanding applications. Abrasion protected motor for increased durability. 115mm Angle Grinder. No-volt release switch|Soft start|Dust ejection system clears majority of dust that passes over the motor. 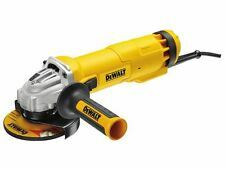 DWE492K 230mm Angle Grinder In Kitbox 2200 Watt 240 Volt Version. DEWALT DWE4206-LX 115mm Mini Grinder 1010 Watt 110 Volt Version. The DEWALT DWE4206 115mm Mini Grinder is fitted with a no-volt release switch that prevents the unit from starting unintentionally when locked on. A side positioned spindle lock gives greater protection to button when using in confined spaces. Soft start. Dust ejection system clears majority of dust that passes over the motor. 1 x DEWALT DWE4206-LX 115mm Mini Grinder 1010 Watt 110 Volt1 x Protective Keyless Guard.1 x Multi-Position Anti Vibration Side Handle.1 x Inner & Outer Disc Flange.1 x Spanner. The Dewalt DWE4206-LX Mini Grinder has a high efficiency motor designed to improve performance in demanding applications.